Did you know your air conditioner makes about 30 gallons of water each day? It's true, and if you've ever experienced a clogged AC drain that has over-flown into your home's interior you probably have first hand experience with the disaster and damage all that water can create. AC drain lines can often clog and if your indoor AC unit happens to be located in your attic, then the water created by the AC system begins to over-flow out of the system and naturally drips on to the ceiling below it - Soaking into the sheetrock, staining and ruining the home's interior. 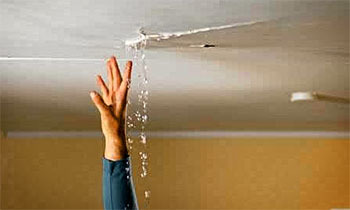 If the issue isn't resolved rather quickly the water will easily soak into the sheetrock to the point where it becomes so saturated with water that the sheetrock ceiling falls apart, collapses, and leaks massive amounts of water into the inside of your home where it can damage all of your valuables. This is why drain line maintenance is so important for every home and should be something every homeowner takes very seriously. Lets go over why air conditioners make so much water, where the water is supposed to drain to, how the AC drain lines actually clogs, and what we can do to protect our homes and prevent clogs from ever happening. "Why do air conditioners make so much water?" Air conditioners make a lot of water. Well, they don't actually 'make' water - They extract and 'squeeze' water out of the air and since Houston's air is generally very humid, this means our air contains a lot of moisture, which then gets extracted by our air conditioning systems as they operate and cool our homes. The reason air conditioners 'make' or extract so much water is because air conditioners not only cool down the air in our homes, but they also dehumidify the air in our homes by removing moisture from the air, thus lowering the temperature and the humidity within our homes. All of this water the AC system pulls out of the air is then collected in a small drain pan located inside of the air conditioner's indoor evaporator coil section and if the system's drain line isn't clogged the AC system then dumps all of this water it extracts from the drain pan into the drain line and (hopfully) drains the water away into your home's plumbing. AC drain lines typically tie into the plumbing of a home under a kitchen or bathroom sink, which is a common place where the drain gets clogged due to the drain line changing size and diameter as it connects to the sink. People are also known for plugging up sinks with all sorts of things - So if the sink doesn't drain well, then unfortunately the air conditioning system doesn't drain well. And if the sink is clogged, then the AC system is clogged cannot drain at all and will begin to over-flow. Some home's take a different approach - Builders have learned that sinks clog frequently so some builders choose to drain the AC system directly into the home's 3 inch plumbing stack located in the attic, and this is great, because it's a lot harder to clog the entire home's plumbing than it is the sink (although it can happen). If you're home's AC system is set up like this, then you're builder did a great job and you'll most likely see clogged AC drain's a lot less frequently than a home that drains the AC system into a sink. Since the AC system is typically located in the attic, it's very close to the plumbing vent that exits through your home's roof and some builders will simply tie the AC drain line into the plumbing vent (which rarely clogs). This means drain lines aren't nearly as long, don't make nearly as many sharp turns, they don't change sizes, and there are just fewer interactions with people and less surface area to clog. "Why do AC drain lines clog?" AC drain lines generally clog due to the growth and formation of bacteria within the drain line. Very rarely can outside objects get into the closed drain (although I have seen it happen). The cold, damp, and dark environment inside a plastic AC drain line happens to be the perfect breeding ground for bacteria, slime, and sludge. Over time this gunk forms and without proper care and treatment just like you see with a untreated swimming pool, and the AC drain lines soon clog because of the build up of this slime and sludge and it drying and solidifying during the heating season when the drain line isn't being used. Murphy's law never fails when it comes to AC drain lines - I'm almost positive it states something about how AC drain lines never give warning as to when they plan to clog up and they also tend to clog right at the wrong time. Clogging usually happens when you're not at home or when you are returning home from a week long vacation only to find a disaster waiting for you when you open the front door - The ceiling has collapsed in your living room and your carpet is soaking wet and you gaze up only to see the indoor AC unit still steadily dripping water onto what was once your beautiful living room - Welcome back! "What can I do to prevent my AC drains from clogging?" In order to keep the slime and sludge from forming in your AC drain lines you have to keep your drain lines treated with bleach or chlorine tablets just like a pool. Several companies make smaller chlorine tablets specifically designed for this purpose (see below). Some people use liquid bleach as an alternative, but as an air conditioning technician I don't recommend using liquid bleach over the tablets because it is a liquid and naturally it flows right through the drain line and doesn't have enough time to stick around and kill off all the bacteria like a tablet would. Condensate pan tablets dissolve over time as the air conditioner makes water and the tablets melt and coat the drain line thus treating the drain line over a longer period of time and this solution works better when compared to liquid bleach. But if liquid bleach is all you have, then use bleach but make sure you order some tablets off amazon or pick some up at the local home depot. 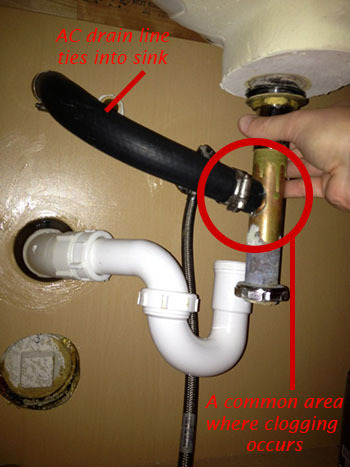 "Will condensate drain tablets unclog my drain line?" Condensate tabs or bleach won't clear or unclog your drain lines if they are already clogged or in bad shape. But they will prevent it from clogging. "How did my drain line get clogged anyway?" Well, over time and through periods of untreated cooling and heating cycles where air conditioners go from running and making gallons of water a day during the summer, to not running and not making any water during the winter, the drain lines go from being constantly full of water to being bone dry. This process hardens all the built up slime and sludge and solidifies it into a calcium-like solid and becomes almost impossible to clear out. During the next cooling season a new layer of slime and sludge forms over the hardened solidified layer and slowly, layer by layer, season by season, the drain line becomes irreversably clogged. When this happens, it's best to have your drain lines replaced by a professional. You can try replacing the drain lines yourself, but keep in mind that gravity is in charge of draining water away from your AC system so the drains need a steady down-hill slope all the way to the home's plumbing (water doesn't flow up-hill) so the water can flow and wont settle or back up and over-flow out of your AC system. Tip: Always test your drain lines first before turning on the air conditioner and walking away after performing any work on them. "Ok, I have the drain tablets/bleach, where do I put this stuff again?" However, some systems don't have this "T" shaped tee adapted to the drain line which means you might have to do a little work to get the tablets into the AC drainage system. If this is the case, you have to actually open up the front cover to the evaporator coil which will be screwed shut and may be taped shut. Locate the evaporator coil, this is the component that looks like a box and has a drain line coming out of it, as well as the copper refrigerant lines. Take the tape off the front of the evaporator coil's housing (if there is any), locate the screws that go all around the front cover of the evaporator coil housing, remove the screws, pull off the cover, and once the front cover is off you can drop the tablets into the internal pan located directly underneath the evaporator coil itself, which 95% of the time is going to be made of plastic so don't break it by leaning on the drain line. Make sure you are dropping the tabs or pouring the bleach into the primary internal pan of the system and not the secondary emergency drain pan located outside of the system (which is usually a big pan made of sheet metal). After you're done treating the drains, make sure to put back all the screws and tape up the front cover when putting it back on in order to prevent air leaks, don't just attempt to tape the door shut for easier access later because the indoor blower motor will blow the door back off if it is not screwed on properly and this will cause more harm than good. Tip: If the cover is left off for too long while the air conditioner is running, the evaporator coil can freeze-up and stop cooling, so try to be quick about treating the drains or turn the system off when doing so if your going to take your time. "How often am I supposed to treat my drain lines?" If your using condensate pan tablets to treat the drains, the manufacturer of the tablet usually lists how many tablets are supposed to be used and how often they are supposed to be added to the system somewhere on the box - It's typically every 3 to 6 months which is why at Adams Air we always clear and treat AC drain lines when we perform our HVAC preventative maintenance tasks. Bleach on the other hand should be added to the system every time you change the air filters during the cooling season, which should be a monthly process. AC drain lines are a pretty serious topic when it comes to an HVAC system because they can cause extensive and expensive water damage to the places we live and work in - Destroying ceilings, furnishings, floors, walls, art, computers, electronics, and more. If your drain line ever does become clogged, you can try cutting it open and clearing it with a wet/shop vac, or blowing it out with compressed air, nitrogen, or with a pump. If your able to get the line cleared and properly draining again, just remember to keep the drains treated more often. If your unable to clear the drains, you're probably going to have to call a professional to attempt to clear them or have them replaced, and remember when attempting to clear your drain lines or replace them on your own, always test your drains with a jug of water and keep a wet vac near by just in case things start to over-flow and get out of control (and they quickly will if you cut them open and they are full of water). Monitor the system for a few hours after turning it back on and just keep an eye out for any water stains on your ceiling below and around the AC system. If you see water stains starting to form on the ceiling, immediately shut the system off and take a wet vac to the drain line and vacuum all the water out of the drain line until you can repair the problem. If caught early-on a wet ceiling can simply be dried, sanded and repainted. 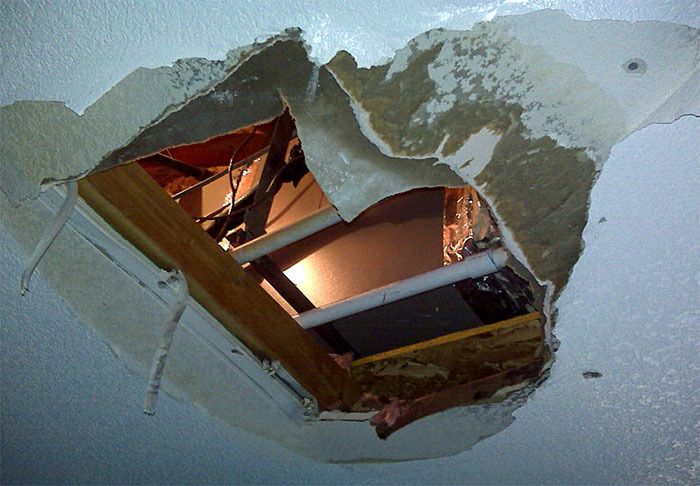 If left too long the sheetrock will absorb too much water and the water will cause the entire section of sheet rock to come crashing down inside your home and then things can start to get expensive. 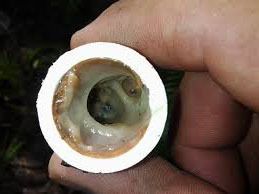 Just be careful when dealing with drainage systems, don't pour drain cleaner down the AC drain line, think twice about how water always flows down-hill and follows the path of least resistance, test and re-test the drain lines with a bucket of water and a funnel, always use PVC glue when re-attaching PVC pipe. Finally, if you ever need assistance clearing your drain lines, replacing your drain lines or any Houston AC repair, the experts at Adams Air are always available to assist.